The legislature has released a $23.9 billion budget for the 2018-19 fiscal year that fails to invest adequately in our schools, communities and people. 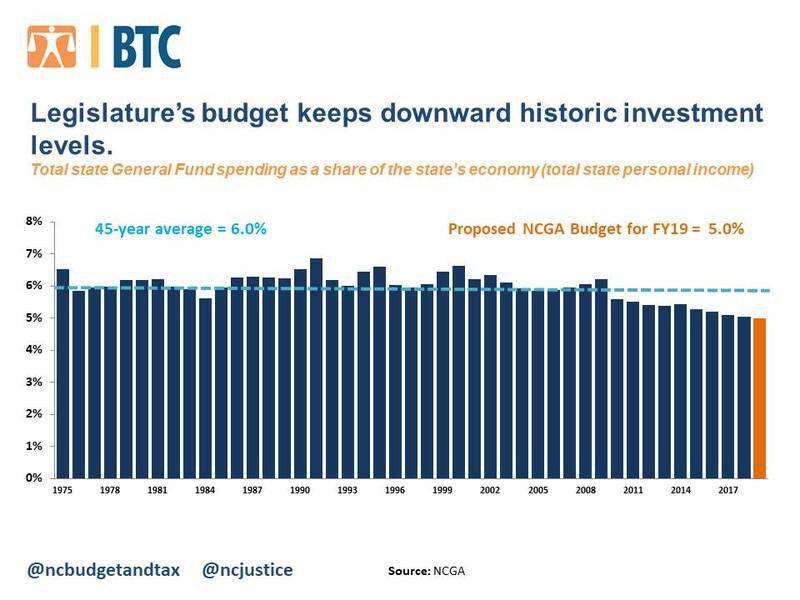 Under the budget, total state spending for FY2019 remains below 2008 pre-recession spending as the proposed budget marks ten consecutive years that state spending has declined as a share of the state’s economy. The budget for FY2019 – which runs from July 2018 to June 2019 – increases spending by 3.8 percent over the prior fiscal year, but this modest increase does not make up for years of under-investment in North Carolina. The budget released yesterday will keep giving out tax breaks in 2019 to wealthy people and profitable corporations, instead of investing those resources in growing a prosperous North Carolina. The new budget includes a total of $24.4 billion in revenue available for public investments for FY19. The majority of this revenue is raised through the state’s tax system, which is expected to provide $22.9 billion in base General Fund revenue for FY19. 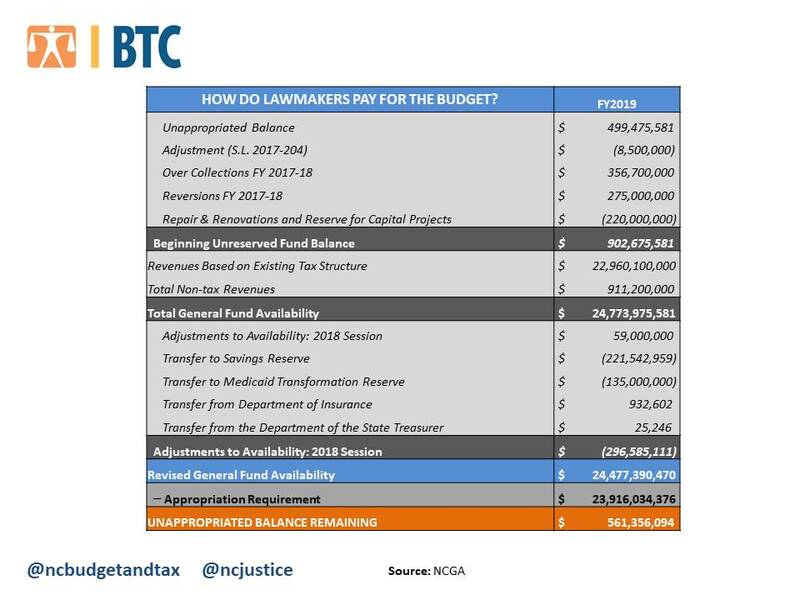 In addition to this base revenue, lawmakers rely on revenue collections coming in above what state officials anticipate ($356.7 million); money from the most recent fiscal year they anticipate agencies will return to the state (known as reversions, estimated at $275 million); non-tax revenues ($911 million); and unappropriated dollars from the most recent fiscal year ($499.4 million). In total, there will be $24.4 billion in revenue available to lawmakers for public investments for FY19. Unfortunately, lawmakers do not fully appropriate the $24.4 billion of available revenue for FY19, and instead plan to carry over $561.3 million. This means continued inadequate state support for public investment across the state budget — public schools, higher education, health services, and economic development, at a time when North Carolinians have been calling and marching for adequate investments. Furthermore, the legislature plans to grant $900 million in new tax cuts for wealthy people and profitable corporations starting in January 2019, building on a failed tax-cut experiment that has already resulted in $2.6 billion in annual revenue losses.